In celebration of our 80th Anniversary, we are excited and proud to present to you a new look to our C.A. Short Company branding. Although we love how it looks, it's so much more than a cosmetic makeover. Our new branding tells our story. That story is that at 80 Years Old, we are still brand new with our ideas and innovations. In 2017, our 80th Anniversary, we are committed to bringing industry innovation throughout all of our departments including Marketing, Sales, Client Services, Purchasing, Accounting, Warehouse, Technology and even in our Partnership Program. Today, we're showing you the cards in our hand. We want to proudly showcase the advancements that we've made in technology and presentation pieces. The C.A. Short way is a new way. But what does that means exactly? You'll see that we have gone through a branding face lift, more accurately described as a reinvention. With 80 years comes a maturity and wisdom that we recognized a need for reflection in our brand. We wanted our branding elements to mirror this maturity. Our tag line has also changed. Although we are 80 years old, we are not stale or stuck in the past. We are bringing new ways to engage, thank, recognize, reduce risk and measure. A new way means we are constantly evolving into the new and better! It's our marketing motto this year! What's a new branding campaign without a new website? When we knew we would be updating our site for the new branding we decided to take the time and evaluate your web experience. We've added new pages like Book a Speaker, Convince Your Boss and my favorite page, Meet the Team. We've also added robust search capability. If you haven't already subscribed to receive update on our blogs and free resources, you can do so here. We've added a solution and updated another one. According to Gallup's most recently published Q12 Survey Results, engaged employees are 6x more likely than actively disengaged employees to recommend their company's products and services. Basically, an engaged employee is proud to work for you and in turn can be your greatest brand ambassador. Why not place your logo onto the items they use and allow them to display this with pride while rewarding them at the same time? This is not a one-stop shop or one size fits all, it can be customized to the client’s individual needs. We have partnered with our vendors to reduce the minimum orders quantities which reduces the inventory liability. Clothing can be printed one piece at a time. In fact, we have no inventory liability on clothing. We have a core assortment of items to choose from, we have the availability to source anything in the marketplace today. Ask what you need and we can find it! Read more about this solution and see how it works by visiting the solution's page. C.A. 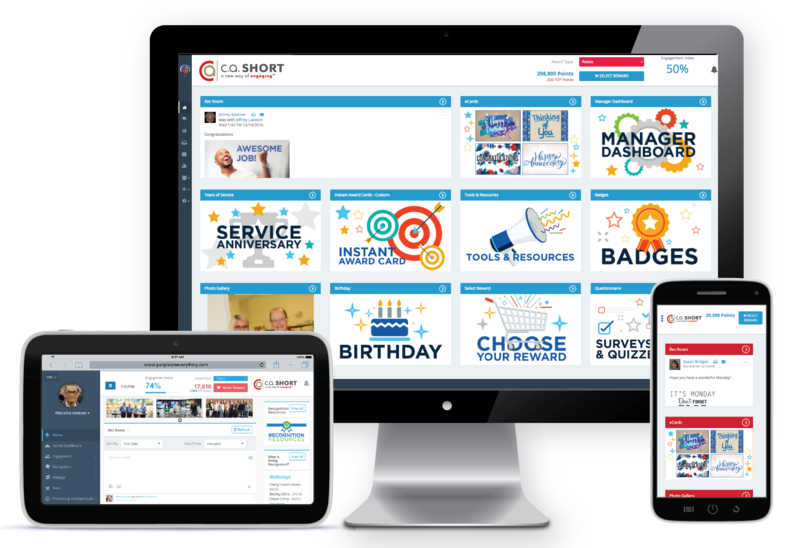 Short Company offers 19 presentation options to compliment your Service Awards Program. Select a framed, unframed, or acrylic individual display certificate. Add a logo pen, key chain, or clock. You decide what best fits your culture and present budget. 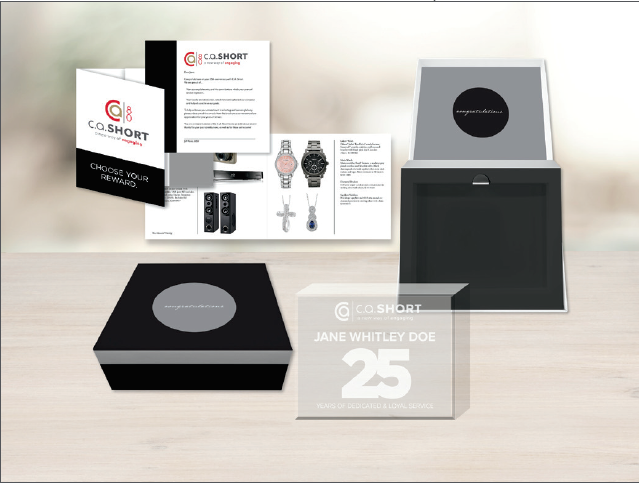 Presentation materials, award catalogs, and all online features can be customized with your branding - at your direction. Increasing corporate identity and program familiarity among your employees are key benefits of this program. This is the most progressive recognition program in the industry. And as if that is not enough, take a look at our new Presentation Box (patent pending). We call it the Game Changer! When coupled with one of our etched acrylic awards, you will create a moment that will last a lifetime. Did I mention we can etch practically anything? New things are coming soon. A new People Are Everything Employee Engagement Platform experience that is designed with ease and engagement in mind with one of the web industry's leading developers. We want to lead in the charge of technology and have made so many strides in the last year to get to that very place. In 2017, our 80th year, you will see us launching a new and improved mobile app while giving our clients the very best technological experience. Last but most definitely not least, we've hired some new folks like Scott Russell, Bill Harris and Jim Drakakis. We've also switched around some departments and employees through Career Pathing and mentoring. In 2017, we've made it our goal to hire or promote the best person for the job. 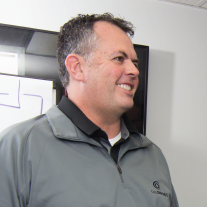 Through our career pathing process, we discovered a unique opportunity to grow the services we provide to our clients and the industry. From this discovery, our Professional Services and Client Services departments merged to become our Client Success Team. This team is continuing to grow and mature providing our clients with everything they need to launch and maintain a successful employee program. We will continue in our pursuit of new and better. We won't stop until we've met our highest expectations and yours. If you have questions on how a new way will or will not impact you, don't hesitate to contact me personally at lhudson@cashort.com.